Beginning TRX: Ready to challenge yourself, but don’t know what it’s all about? This is the perfect introductory class for you. Intermediate TRX: For those who are familiar with the system and are comfortable adjusting their own straps. 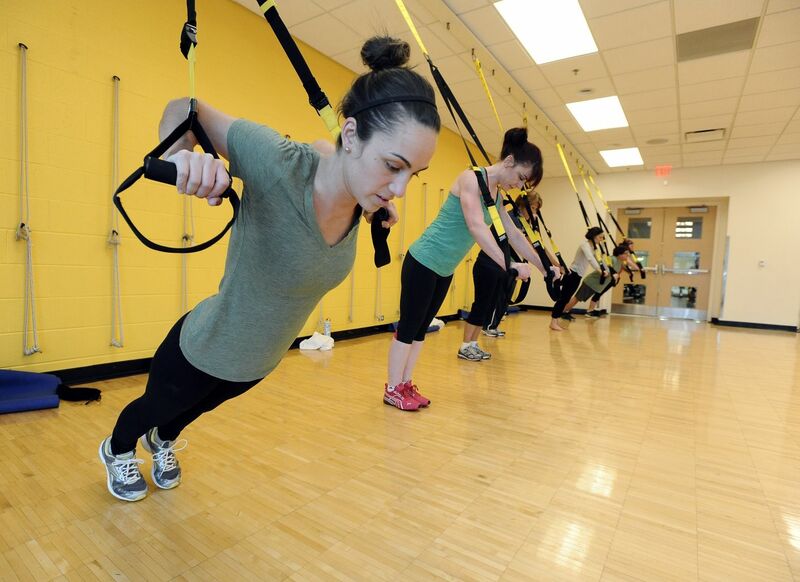 Advanced TRX: This class is for those who really want to test their limits and who have ample TRX experience. HIITRX: High intensity interval training (HIIT) techniques like tabata intervals will be used to supercharge your TRX Suspension Training workout. The basic HIIT technique is to alternate periods of extremely high intensity exercise with short rest periods for a specified number of sets. HIIT can give you a tremendous aerobic, anaerobic, strength and power workout rolled into one without the boredom of long, steady cardiovascular exercise on a machine. Combined with the versatility of TRX Training we utilize hundreds of exercises to build fun and effective HIIT workouts. HIITRX offers a variety of pre designed workouts incorporating all aspects of the TRX system, as well as cardio equipment and some weights. In addition, the HIITRX class incorporates some group-based games and activites to add some fun and suprises to the workout. Come to class prepared for a fast-paced, fun and challenging workout. Suspension Training body weight exercise develops strength, balance, flexibility and core stability simultaneously. It requires the use of the TRX Suspension Trainer, a highly portable performance training tool that leverages gravity and the user’s body weight to complete hundreds of exercises. Several skill levels are available, please click Register button to find the level appropriate for you!